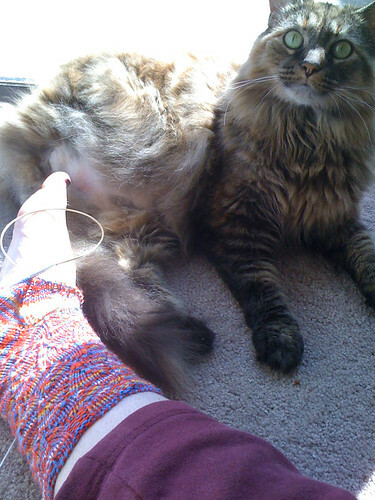 I've been suffering from a bit of cast-on-itis. Figured today while the sun was out was a good opportunity to show off some of what I've been working on. Special thanks to Tripsie for sharing (sort of) the one spot of natural light in the apartment. The yarn is from my Retro Video Game sock club 1st shipment and it represents one of my first video games ever, Super Mario Brothers from the NES. 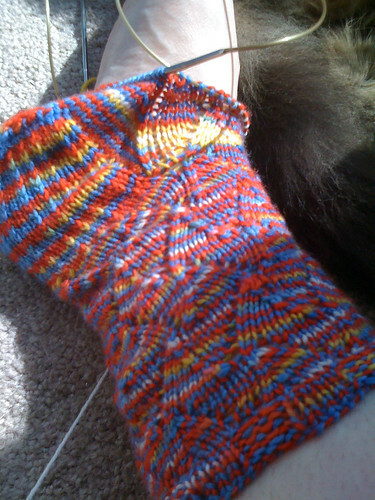 The pattern, is called PoppyCock Socks and came from the Loopy Ewe. 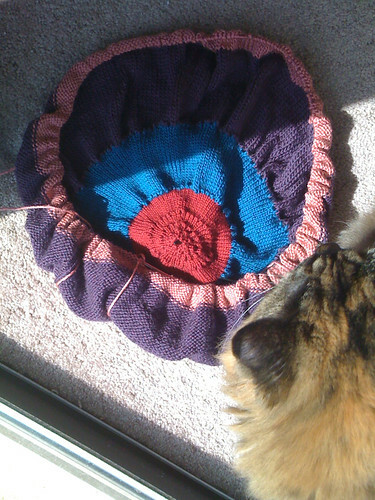 I've also been working on a Pi blanket/shawl thingy. Its my "sims" knitting because its just knitknitknitknitknit so I work on it while I play sims. "I like to sit under the desk and wait for the yarn to dangle down. 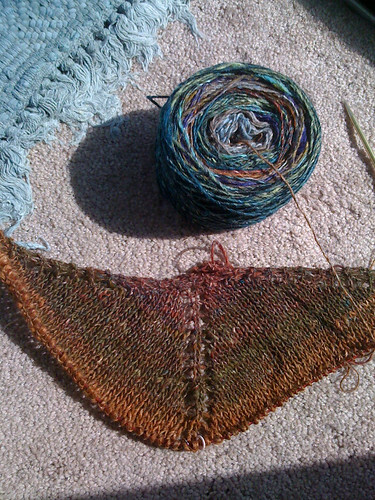 NOMNOMNOM"
While I was there I bought me some Noro, and last night I cast on for a "Traveling Woman" shawl. I can't wait to see how the colors come through :) I have a bit of a wonky bump on my cast on edge becuase I didn't understand the instructions quite right, but since that's at the top I figure most people won't even see it. Yesterday I went to Roanoke. Next week I am traveling to Richmond for work. The 17th we are going to Charlottesville to see Metallica!!!! The weekend of the 23rd I will be going to North Carolina to attend SAFF Again with Mom. I wish I had a chauffeur who could drive me everywhere, so that I could knit in the car! haha, I laughed out loud reading this post...I also have "sims" knitting at hand! Hubby and I are obsessed with Sims 3!